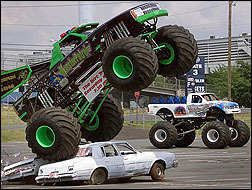 Among the prime time shows in development is a show that drives real-life families into the high energy, fantasy design and operation of Monster Truck action while at the same time placing these larger-than-life Monster Truck characters right in the middle of suburban life. Clear Channel's U.S. Hot Rod Association (USHRA) Monster Jam events featuring such crowd-favorite vehicles as Grave Digger, Maximum Destruction and Monster Mutt, and drivers like Dennis Anderson, Tom Meents and Debra "Madusa" Miceli, draw more than 3 million fans each year, filling stadiums across the country and, increasingly, around the world as well. The consistently sold-out live events appeal to a wide array of demographic and economic sectors. Original Productions is regarded as the leader in creating hit shows that target motor sports fans, and now has grown to include a wide range of entertaining, provocative scripted and reality shows. Original is behind the hit show, “Monster Garage” — customizing legend Jesse James and an all-star crew transform ordinary cars into extraordinary machines, all in just one week — and has become a signature show on the Discovery Channel. It also has spawned such hit series as "Monster House" and "Monster Nation." "Clear Channel Entertainment's Monster Trucks are hugely entertaining and spectacularly successful,” said Thom Beers, CEO of Original Productions and executive producer for all of the company's series. “We're excited about our show concepts that will take this exceptional live experience into the episodic TV world. Monster Trucks are just the beginning. Other Clear Channel Entertainment events like the supercross motorcycle racing series and the Thunder Nationals have all the star power, sensational visuals and raw energy that make for irresistible TV." "The teaming-up of program development leader, Original Productions along with Clear Channel Entertainment's – Motor Sports is truly powerful!" said Charlie Mancuso, president, Clear Channel Entertainment – Motor Sports. "Original Productions has the ability to create exciting programming that will energize the millions of loyal motor sports fans while engaging new audiences. We are proud to be working with Original Productions and taking the strengths of these two industry leaders in captivating the amazing thrills, dedicated enthusiasts and legion of stars of specialized motor sports for network and cable television."